Using light to provide feedback for your robot can be as simple as a single LED, or more complex using multiple LED colors. In this article, we’ll discuss simple techniques to communicate using light with your Arduino-based robot. The projects are simple to do, with only basic components and wiring needed. The announcement that RoboGames was not being continued by Dave Calkins and Simone Davalos started a FaceBook conversation with over 1,000 comments. A spinoff post worthy of recording as part of our “History of Robot Combat” series also ensued. Find out the latest evolution in this home brewed version of Willow Garage’s PR2. Robotics truly has worldwide appeal, and that was very apparent with over 17 entrants from international countries competing at this year’s event. One of the goals of the Boise Robotics Group (The BoRG) is to teach folks how to make robots. See what they did and some of the lessons they learned themselves. What do you get when you give your robot a GPS module, a microSD card, and a temperature probe? A robot who knows where it's going and can tell you where it's been. Depending on where your robot is or is going, it may be wrapped up in an overcoat or sporting a Hawaiian shirt. MATRIX Robotics enters the “kit” competition with a brand new 3D metal construction system that is perfect for use in events like the FIRST Tech Challenge, as well as for hobbyists and educators. When combat roboticists are in the off-season, they take some of that technology and build race cars. Find out what happened when Team KISS Robotics and Team Plumb Crazy joined forces at a recent event. This time, the team discusses mechanical changes, the biped systems, and using the Gazebo simulator as they continue work on Watson. Did you know that there are community-developed hardware robot designs that are freely licensed and downloadable? If not, you need to check out this overview of different platforms that have been developed over the last two decades. Explore some unconventional ways of creating robots that can learn to solve problems on their own. After being in a severe accident, implementing robotics into the recovery process took on a whole new meaning. Small, ready-to-use wireless modules let you control things like your robot’s motor speed and actuators. New bot builders can follow the examples given here to get off to a good start using XBee modules. Get some unique insight into the original series from Syfy from the man who created all the fighting robots. Ross Mead from Team AXE gives his perspective on the groundbreaking competition/TV series that aired recently. Experiences with each type of printer are summarized, and a list of 13 tips to keep in mind when buying a 3D printer are given to wrap up this series. More and more, scientists are looking to the anatomy of the human body to maker smarter and faster machines. Spinning a couple of motor shafts and positioning a hobby servo has never been easier. The combination of the Digilent motor shield, 32-bit Uno32, and ready-to-roll MPIDE motor shield library takes all of the pain out of robotic motor control. Dealing with the DRC qualifications, having to rebuild yet again, and taking those first steps. In the mechatronic world, it’s all about control. See how to gain worldwide dominance using some simple CCS C code, a Wi-Fi module, and a handful of Microchip silicon. As a member of the winning Team Crash, Dave weaves a wonderful tale of his and his daughter, Amber’s life-changing experience on the show. See how to navigate your robot’s way around by implementing an electronic compass. With Tibbo, you can write a few lines of Basic code and exchange data with peers and hosts via the Internet. The Tibbo EM500 is perfect for retrofitting devices with serial ports for use on the Internet. How can you implement it in your next bot build? In this second installment, Team Walk Like a Man describes the mechanical design of their Track D entry hopeful, Watson. Part 3: Assembly! This time we put our quadcopter together, with plenty of tips and techniques given along the way. By giving your robot just a rudimentary ability to identify objects, you can increase its ability to cope with more complex situations. There has been a great deal of hype around 3D printers lately. If you are planning on purchasing one, be sure you read this article series first. What you find out may surprise you. Read one team’s chronicle of what it will take to compete in track D of this monumental event. Learn about interfacing switches to the ArdBot II, along with how to use the info these sensors provide to interactively command the robot’s motors. 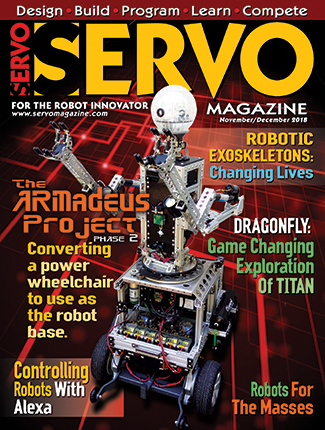 A storm of SERVO Magazines came down on spectators at a recent holiday parade. Preparing for the 2012 Roborama contest course inspired a melding of Mars rovers, self-driving cars, and lane-following technology that gave rise to JRover. College students descend on the Kennedy Space Center for NASA’s yearly contest to build lunar rovers. Sometimes it’s important to just build a robot for fun and entertainment for both ourselves and others. Although RASSOR is far from being space-ready, this autonomous machine will ultimately play a key role in being able to process water and fuel from lunar soil. As part of NASA’s annual event, special workshops were held for school-aged children — all the way down to preschool — to help foster a love for STEM education by learning to use LEGOs to build bots. See highlights from this year’s classic event. Part 6: APM 2.5 Per reader requests, this final installment of our quadcopter build will discuss the APM 2.5 controller in detail. Filament is the life blood of a 3D printer. This month, various types of filament are discussed and how to calibrate the printer for a specific kind. Originally debuted in 2010, ArdBot is back with a more slim line design, plus lots of added Arduinos for all kinds of new features and capabilities. Now that we’ve wrapped up our series on 3D printers, we’re going to build a fighting robot with them. Read about some add-on items that hopefully will inspire your imagination. Holonomic robots are omnidirectional and incredibly mobile. Here is a look at these types of robots constructed with two different styles of wheels. Learn how to add video to any robot — remotely controlled or not. Plus, also discover how to overlay textual data so you can get feedback, as well. Part 2: Their Use With Robotic Arms. Using the principles of identification discussed last month, we’ll have our mobile robot find and retrieve objects with an arm and gripper. Building robots with a great finished look doesn’t have to be difficult or expensive. This article will show you how to construct a personable, cost-effective robot out of a trash can. We’ll move forward with completing the ArdBot II’s electrical subsystems, and give our robot its first taste of adventure with a simple servo test routine. Here’s a nifty little solid-state switch that lets you power-down your creations to help extend battery life. Part 4: Setup. Program and calibrate the ESCs; set the direction of the motors; see step-by-step how to install the NAZA flight controller; install the props; and get ready to take your Flyer for a spin. This eighth grader shows us how to hack a vacuum bot to turn it into a TABLEBot for competition. As a follow-up to the hugely popular Give Yourself a Wedgie project that appeared in the October 2012 issue, this article will show you how to add either a clamp or lifter weapon to your robot. This time, we’ll go over the wheels, gears, and chassis parts for our PBOD. In this final installment, we’ll take a $2 TV remote and command the ArdBot to do our bidding from a distance. Building a beverage-serving bot takes a fair amount of time and money. Learn how some of the entries came up with their creations for this popular annual event. This time, slicer software that is used to convert 3D models to instructions a printer can actually understand will be covered, plus the MakerGear M2 arrived! Most hobby robots are powered by small microcontrollers with limited capabilities. Could using a tablet instead with all its available features be the best way to rock your robot’s world? Finish construction on the DIY VEX electro-mechanical compass, and get the I2C firmware necessary to make it work. Follow the assembly process on four different 3D printers, so that next time we’ll be ready to actually print a simple object. See what it took to get from a ready-for-action printer to a first print. • Diggin’ It at NASA • Literally for the Birds • A UAV to Track Taliban • And a UAV to Track You • Creepy Times Two. • Touchy-Feely for Less • Prototype Power Line Inspector • The Future of Clothes Shopping? • Chewing Up the Mint? • Robo Suit in Final Trials • Insect Vision for Bots and More • Aerobatic MAV Takes Flight • Bot Flips the Bird • Sniff This! • Just Think • This is Research? • Kibo Bot Destined for ISS • Bot is Diggin’ It. They may not be able to transform into cars, trucks, or aircraft, but there is a lot of stuff these manipulators can do. A Q&A with the makers of these cylindrical swimming automatons. Communicating with Dynamixel servos using MPIDE. “Cyro” mimicks its real life counterpart’s ocomotive capabilities to make it useful in both research of thesea itself and ocean-based surveillance. 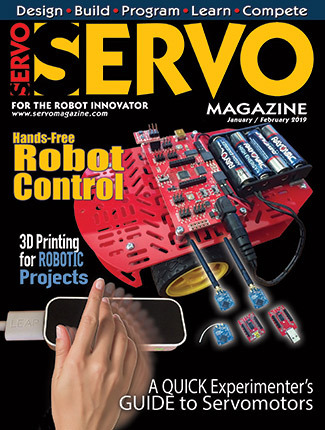 Hip, new robots from Barobo, Inc., build on themselves to form educational and prototyping platforms, as well as enable new hacks for the creative roboticist. Selecting servos for a walking robot. This is why robotics is so cool ... you can go from working on top secret Army bots to making animatronics for blockbuster movies. Putting the RoboBuilder Creative kit in motion. UC Davis — a 100+ year old institution of higher education — is encouraging STEM (Science, Technology, Engineering and Math) educational enhancements through the use of Mobots: a robot module platform created by Engineering Professor Harry H. Cheng and his master's student Graham Ryland. The plastic Mobots with their user-friendly programming and software are already in use in many area schools. Getting Your Raspberry Pi’s Proper MBs. Working out interfacing issues with servos other than the Robotis Dynamixel AX12s. Creating autonomous behavior with Action Builder from the RoboBuilder Creative kit. A closer look at LEGO’s new EV3 robot. 4D Systems is offering some new smart OLED and LCD display modules that will play well with your robots. One of the things we love about robots is that they are such perfect teaching tools. Few things capture the imagination like robotics ... except maybe space elevators. Exploring the full potential of 4D Systems smart display modules, with an “Eye” towards coordinating expressions with sensor input. You can build a robot out of pretty much anything, but if you find yourself debating between general categories like wood or plastic or metal, this is the article for you. These “printer wars” show how even newbies can get started into the fascinating and terrifying world of robotics with junk. Just as man's ancestors began to walk on two legs, robot experimenters decided over a decade ago that a bipedal humanoid robot was the holy grail of robotics. Science fiction movies always showed robots as two-legged walking creations. I would like to begin our discussion of robots working around people with a look at some of the latest telepresence robots. Multi-rotor flyers are proving to be the next level of robotics. Parts to build great robots are all around us. Just use your imagination the next time you’re shopping at the local hobby, hardware, marine, RV, or toy store. Learn about the beginnings of this ground-breaking company and some of the products they’re famous for. Take a historical look at how LEGO got started and where they are today. Tips, techniques, and types to consider when selecting the foundation for your bot. There once was a time when robot builders had only a few sources for project parts. That is no longer the case. Robots can serve humankind in many positive ways. The concept of exoskeletons is not new. Read about where we’ve been and where we’re going with devices that enhance human performance. What will the legal implications be if robots violate human rights? The “magic smoke” from burned out motors and electronic speed controllers (ESCs) is inevitable in combat robotics, and getting those parts replaced quickly can make the difference between working your way through the brackets to the finals and an ignominious forfeit and early exit. Just in time for Christmas shopping, regular contributor Mike Jeffries has assembled a buyer's guide of three vital components for small sized bots. I won't be talking about tools that are particularly specialized. If your machine needs any specific equipment for basic maintenance and repairs, those take priority. The following sections will cover tools that are almost universally useful in the pits during an event. 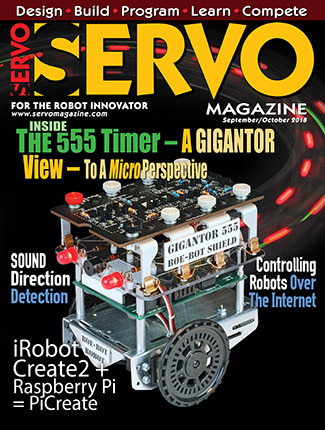 In a recent issue of SERVO, I wrote about scaling up my successful six pound Mantisweight class flipper Threecoil into a 30 pound Sportsman class robot. In Part 2 of this series, I discussed how I made the chassis and drive train. In this part, I will show you how I wired the bots and set up the transmitter and receiver. I have been building fighting robots for several years, and starting in 2009 I managed to build a 12 pound robot named Scurrie that won several competitions in a row. After some time, I was also successful with a 30 pound shell spinner named Tetanus. Judge Dave (Calkins) is one of the original BattleBots judges, founding RFL member, founder of RoboGames, and co-founder of ComBots. These are his words of wisdom. Ignore them at your peril. The National Robotics League (NRL) 2013 Championships held in Indianapolis this last May, featured 48 robots built by nearly 200 students from 25 schools across the US. For the last 16 years, I have been building and competing in robot combat. You name it, I’ve probably built it — from walkers to brick bots to full power flippers to hydraulic crushers in almost all weight divisions. Is This the Future of Combat Robotics? The Miami-Dade County Fair & Expo brings thrilling rides and mouth-watering food to South Florida each year. Eleven teams brought a total of five 150 gram Fleaweights, 11 one pound Antweights, and six three pound Beetleweights to compete in three brutal double elimination tournaments. Keres was built to test some prototype Mini-Spark gearboxes from FingerTech Robotics. For as long as I can remember, there hasn’t been a power switch designed for the 150 g to 3 lb combat robot classes that is readily available. Last year, the Combat Zone published a series of articles covering the history of the sport by recovering the undocumented, nearly lost information about each of our sport’s major events — past and present. Now, 10 years after the demise of major television coverage, we tracked down some of the most famous names from that era to gain their perspective on what some see as “the glory days” of the sport. Our first victim is competitor and host of “The Builder’s Corner” from the BattleBots™ series. This month, I will discuss the fabrication of some of the parts that made up the flipper assembly in Threecoil. Robot Battles 47 took place over Labor Day weekend during DragonCon in Atlanta, GA. At DragonCon, Robot Battles consists of two independent events. Richard Stuplich first came to the public’s attention in the final two seasons of BattleBots. His super heavyweight, New Cruelty, was eight wheels and 220 pounds of rock solid battering ram. This article is a mini build report from my perspective of getting the bots and boys ready for their first event with their own "real" combots at Battle at Maker Faire, which took place on October 5th at the Orlando Mini Maker Faire. EVENT REPORT: GCRS 11 — Robots, Birthday Cake, and Off-Road Trucks! GCRS 11 continues its series of events hosted by Jim Smentowski, owner of The Robot Marketplace. The events give Florida Insectweight robot builders a chance to get together for a day of robot battles with some new competitors, as well as to continue some long-fought rivalries! 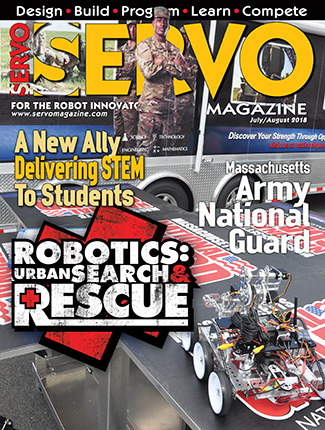 Just this February, the Northeast Robotics Club ([url=http://www.nerc.us]http://www.nerc.us[/url]) hosted the 11th annual combat event at the 2013 Motorama motorsports extravaganza and custom car show ([url=http://www.motorama]http://www.motorama[/url] events.com) in Harrisburg, PA.
Kitbots and FingerTech Robotics have joined forces to develop a new range of hubs for smaller bots. Young up and comer, 12 year old Chad Savage from Edinburg Twp., OH took third place in the Ant class at the 2013 HORD (House of Robotic Destruction) tournament held in Brunswick, OH. The fall of 2012 posed a challenge for the members and supporters of the Chicago Robotic Combat Association (CRCA). Playing bot hockey is great fun, and it’s a big hit with the crowds at events. I have my own full team of 15 lb class bots. Jim Smentowski is the builder of one of the legendary bots in our sport: Nightmare. One of the challenges when designing a Fleaweight (150 g) robot is finding lightweight components that allow you to squeeze the most out of the limited weight allowance. Here’s how the smaller bots fared at Robot Battles this year. Thirteen Antweights and 15 Beetleweights competed in the Micro Battles event. Both classes had a diverse selection of machines competing for the win. The Banebots BB-12-45 was for many years the most commonly used speed controller in the 12 lb Hobbyweight class of combat robot. RoboGames — the largest robotic event in the world (according to Guinness World Records!) — returned to the San Mateo, CA Exposition Center April 19th through 21st. PennBots — the Robot Club of Pennsylvania — hosted their Second Annual Fall Fling on November 17, 2012 at the Yellow Breeches Middle School in Boiling Springs, PA. When it comes to the glory days of televised robot combat, few competitors can beat Carlo Bertocchini's record. Half the battle in combat robotics is having your bot repaired completely in time for the next fight. This is the first of a series of short articles detailing some ways to make that just a little bit easier. Iwas lucky enough to get a chance recently to test the new RageBridge dual channel brushed DC motor controller from Equals Zero Designs (e0designs.com). It is convenient to have all four batteries on one charger, and it takes up less space in the pits. It’s also a little cheaper than having four separate chargers, but it could also mean that if it fails you may lose all four at once. What MFG.com does is provide a location for users to post quote requests for custom fabrication. Once you've posted a quote request, shops from your specified search region (US, North America, Global, or specific national and international locations) will then be able to see your quote request and bid on it. In the 150 g weight class, there are only a few options for drive systems. Ioften attend shows where I’m either demonstrating combat robots and bot hockey, or as a sponsor providing prizes of Kitbots products. In order to inform the public about the event or the products, I have several banners to hang up on the walls, plus I also hand out business cards and information sheets when I have the time. It would be useful, however, to have a more eye-catching and informative way of passing on the information.